Postcard of Keith Piper’s Go West Young Man, photograph on paper mounted on board, 84 x 56 cm. The postcard was one of a 16 postcard pack issued as part of the merchandising of the Tate’s 2012 Migrations exhibition. This work of Piper’s was included in the exhibition. The pack contained cards of work by Benjamin West, Joseph Van Aken, James Tissot, Marcus Gheeraerts II, Jacob Kramer, Oskar Kokoschka, Kurt Schwitters, Sonia Boyce, William Rothenstein, Lubaina Himid, Jan Siberechts, Frank Bowling, Keith Piper, James Abbott McNeil Whistler, and John Singer Sargent. 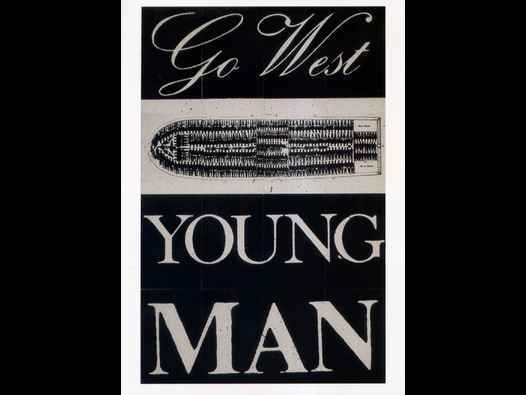 Keith Piper’s Go West Young Man had, a year or two earlier, been exhibited as part of Afro Modern at Tate Liverpool. In 1987, Piper deployed the infamous Brookes of Liverpool motif in an engaging, expansive series of photomontages titled Go West Young Man. [i] The famous words, “Go West. Young Man, Go West” were first used in a newspaper editorial to encourage the westward migration of Americans, in the middle of the 19th century. According to David C. King, Westward Expansion (American Heritage, American Voices series), “in 1851, a newspaper editor named John B. L. Soule wrote those words in a newspaper, the Terre Haute [Indiana] Express. Horace Greenley, well-known editor of the New York Tribune, was so impressed by the enthusiastic editorial that he printed the entire piece in the Tribune. In a brilliant gesture that served to counter or challenge the pathology that it was perfectly in order for the Aboriginal peoples of America to be dispossessed of their land, Piper juxtaposed the romanticised admonition of the newspaper editorial, with the image of the slave ship. In so doing, he created a plethora of new meanings. One of the most striking of these new meanings was the interplay between forced migration and perhaps more voluntary (or at least, less forced) forms of migration. The US is a country of immigrants, with two striking exceptions. Firstly, those Aboriginal peoples massacred and dispossessed of their land, and secondly, those captured Africans who arrived in chains, destined for the auction block. The romanticized memory of noble migrants, westward-bound, took no respectful account (or indeed, interest in), the woeful experiences of those two hapless groups of people. Piper though, obliges us to do so, as the slave ship represents, in the most graphic and violent of terms, forced travel, forced movement, and forced migration. It is this interplay between the sentimental portrayal of the frontiersman, and the wretched existence of the slave, that gave the first panel of Piper’s Go West Young Man, such power. Likewise, this interplay acted as a substantial and scene-setting introduction to the other thirteen parts of the historical panorama that Piper again offered. A full-page image of Piper’s Go West Young Man appeared on one of the opening pages of the Migrations catalogue. [i] Keith Piper, Go West Young Man, Photograph on paper mounted on board, in fourteen parts, each: 840 x 560 mm on paper, unique. Tate Collection.